It sounds like I am talking about a geologist taking a piece of meteorite and putting a smooth edge on it with a beautiful gloss. I guess I am, but we are talking on a grander scale of course. How is stone polished you ask? Kind of like wood it is abraded until it is smooth and with a final step it is honed smooth to a glossy end result. The big difference being that stone does not like topical coatings. Stone needs to breathe. I make stone sound almost human don’t I? Stone floors all follow the same procedure to get to the final stage, which is when the differentiation occurs. It all depends on the type. We can dig in deeper when time permits of course. In this article I am going to talk about some of the softer stones like Marble, Travertine, or Terrazzo (which is marble mixed with aggregate). Stone is basically cut like wood, sanded like wood, and brought to its final stage like wood. There is however a much greater pressure required and a good bit more time and weight. By using diamonds you can develop a smooth nearly flawless finish on many marble surfaces. 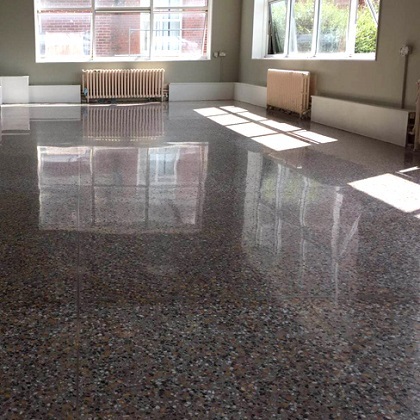 Followed up with the correct polishing paste you can have a floor shiny as a mirror. Yup it sounds simple and it is. A bit of direction and the right tools and you can do it! Absorbents: What do you Need to Know?